Heart-lung transplantation is the replacement of the native diseased heart and lungs by transplant of donor heart and lungs. Heart-lung transplantation is required when blood ventilation (air exchange) is inhibited. Inhibited oxygen and carbon dioxide transfer prevents the delivery of oxygen to the tissue and results in carbon dioxide levels in the blood that are higher than normal. Additionally, pulmonary hypertension can cause compromised cardiac function. There are factors which absolutely contraindicate (rule out) heart-lung transplantation, including multiple organ system dysfunction, current substance abuse, bone marrow failure, active malignancy, and HIV infection. Other relative contraindications include age greater than 55, anorexia, obesity, peripheral and coronary vascular disease, ventilator support, steroid dependency, chest wall deformity, and resistant infections by bacterial and fungal agents. Mental health status should be addressed, as well. Patients who are limited in daily activity, as defined by their doctors, and have a limited life expectancy, are candidates for heart-lung transplantation. These patients suffer from untreatable end-stage pulmonary, organ, and/or vascular disease. Most often, the diagnosis includes primary pulmonary hypertension brought on by congenital blood vessel defects that include malformations in the lung. Congenital cardiac defects and other diseases may also be responsible. Donor matching is managed by the Organ Procurement and Transplantation Network (OPTN), in which all organ centers must participate according to Federal Medicare and Medicaid programs. Established criteria for donor organ matching include the following: anatomic and immunologic compatibility between the donor and recipient; medical urgency; efficiency in organ distribution for improved organ viability; and ethical considerations. After a match for anatomic and blood group compatibility with the patients on the donor list, the organs are distributed on the basis of seniority in list standing among suitable recipients. Patients with IPF are provided special consideration on organ donor waiting lists. The average waiting time on the heart-lung transplant list is 795 days. Cardiac monitoring is a necessary part of heart-lung transplantation. Under general cardiac anesthesia, an incision is made in the patient's chest to access the heart and lungs. Anticoagulation (anti-clotting) medications are provided, and cardiopulmonary bypass to a heart-lung machine is instituted. Blood flow is discontinued through the heart by application of a clamp across the aorta. 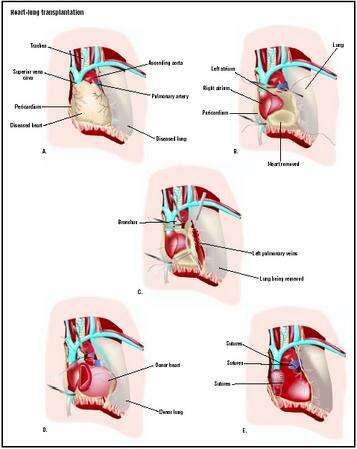 The surgeon removes the diseased organs: in the heart, the native right and left atriums are left intact, along with the native aorta beyond the coronary arteries. This provides large suture lines that allow decreased surgical time and result in fewer bleeding complications. The donor heart is dissected to match the remaining native heart and aorta. The sutures are made to join the structures. Once completed, the cardiac chambers are deaired as the organs fill with the patient's blood that is diverted away from the heart and lung machine. Mechanical ventilation of the donor lungs helps to purge any remaining air from the cardiac and pulmonary structures and inflate the lung tissue. History, examination, and laboratory studies are performed prior to referral to a transplant center. These records are reviewed on-site for qualification to be placed on the United Network for Organ Sharing (UNOS) national waiting list. Procedures necessary for evaluation include a chest x ray , arterial blood samples, spirometric and respiratory flow studies, ventilation and perfusion scanning, and cardiac catheterization of both the right and left heart. The patient will be treated in the intensive care unit upon completion of the surgery, and cardiac monitoring will be continued. Medications for cardiac support will be continued until cardiac function stabilizes. Mechanical circulatory support may be continued until cardiac and respiratory functions improves. Ventilator support will be continued until the patient is able to breathe independently. Medications to prevent organ rejection will be continued indefinitely, as will medications to prevent infection. The patient will be evaluated before discharge and provided with specific instructions to recognize infection and organ rejection. The patient will be given directions to contact the physician after discharge, along with criteria for emergency room care. General anesthesia and cardiopulmonary bypass carry certain risks unassociated with the heart-lung transplant procedure. Graft rejection and technical failure are a result of lung injury sustained during the stoppage and restarting of the organ. Infection by cytomegalovirus (CMV) occurs in the first year, but is usually treatable. Immunosuppressive drugs to prevent rejection have side effects associated with malignancies; lymphomas or tumors of the skin and lips being most common. Osteoporosis and nephrotoxicity are also associated with the immunosuppressive therapies. Lung and cardiac function are drastically improved after transplantation. Strenuous exercise may still be limited, but quality of life is greatly improved. Of all heart-lung transplant recipients, 90% are satisfied with their decisions to undergo the transplantation procedure. The patient will continue with medical visits frequently throughout the first year, including required tissue biopsies and cardiac catheterizations. The frequency of medical visits will decrease after the first year, but invasive medical procedures will still be necessary. Medications to suppress rejection of the organs and prevent infection are continued. Systemic hypertension is common in almost half the patients at one year after surgery and can be relieved with medical treatment. Chronic bronchiolitis is expected in one-third of patients at five years. Hyperlipidemia (high lipid concentration in blood), diabetes mellitus, and kidney dysfunction are also seen in some patients within the first year of transplantation and continue to affect an increasing number of patients each year. Malignancies that include lymphoma and lip and skin tumors are seen at a higher rate than in general populations. Death within the first 30 days is usually associated with technical and graft failure of the transplanted organ. Rejection of the cardiac organ includes chronic coronary artery disease affecting a small percentage of patients, while bronchiolitis (inflammation caused by rejection of the lung) is responsible for the death of 60% of patients between the first and fifth years. Untreatable infections are a persistent complication in the initial 30 days and continue to affect patients into the fifth year, and result in death. Acute rejection is uncommon, but it is a complication that can also lead to death. Five-year mortality is higher for patients with ventilator dependence, retransplantation, congenital disease, and in recipients over 60 years of age. Heart-lung transplants are becoming less common. Since 1990, only 40 to 60 of these procedures are performed every year in the United States. The outcomes of single- and double-lung transplantation have provided good success for pathologies where the cardiac function is not jeopardized. Hensley, Frederick A., Martin Donald E., Gravlee Glenn P., ed. A Practical Approach to Cardiac Anesthesia, 3rd ed. Philadelphia: Lippincott Williams & Wilkins Philadelphia, 2003. Turlock, Elbert P. "Lung and Heart-Lung Transplantation: Overview of Results." Seminars in Respiratory and Critical Care Medicine 22, no.5 (2001): 479–488. Cardiac surgeons and cardiovascular surgeons can be trained in transplantation surgery during their residency. Young adults and pediatric patients are treated at centers that specialize in the care of children. As of October 2003, 83 medical centers were approved to provide heart-lung transplantation. During 1998, of the 77 centers approved for the procedure, 41 centers performed fewer then 10 procedures and 16 centers performed more than 20 procedures. How many of these procedures have been performed at this center in the last year and last five years? How many of these procedures has the surgeon performed in the last year and last five years? What is the length of time spent on the waiting list for a patient with the pathology of the patient? What are the complications associated with this procedure? What are the complications associated with the duration of the transplantation? What type of limitations will be faced if the transplant is successful? How frequent will future medical visits be after the procedure during the first year and after that? My mother-in-law has pulmonary hypertension so now she needs a heart and lung transplant (both lungs). I want to know if the surgery can be done without a drop of blood transfusion of any kind and if so, where can I find help? Thank you beforehand and I appreciate your time.